If there’s something that keeps me going not only in the kitchen but in life as well are the surprises that could be lying beneath the simplest things that cross our paths. Take for instance a simple white chocolate bar. Probably the underdog of the chocolate world. But you take a bite and are hit with freshness of orange citrus and suddenly with a stingy note of chili pepper. Now you are celebrating you decided to take a bite of that white chocolate bar. I’m celebrating I decided to take that bite. The bar is the Jcoco’s Cayenne Veracruz Orange white chocolate bar. And I’m so happy they asked me to create a recipe with one of their products, because I got to taste this interesting flavor. And it was exactly like I just said before. I could appreciate the high quality of the chocolate. And the flavor experience was very black and white, and I love those kinds of flavors. I tasted the floral notes of orange and just after the heat of the chili hit me, I needed another bite to calm that down with the freshness of the orange notes. Suddenly I was in a delicious loop! Another surprise of Jcoco, they are partners with food banks across the nation. For every bar sold they donate fresh food servings for those in need. Food is something that should unite us and it’s meant to be shared, no matter if we do it on our family tables or on tables that serve members of our communities. All this will without sacrificing the high quality chocolate they use for their products. I’m very proud and honored to collaborate with companies such as Jcoco. 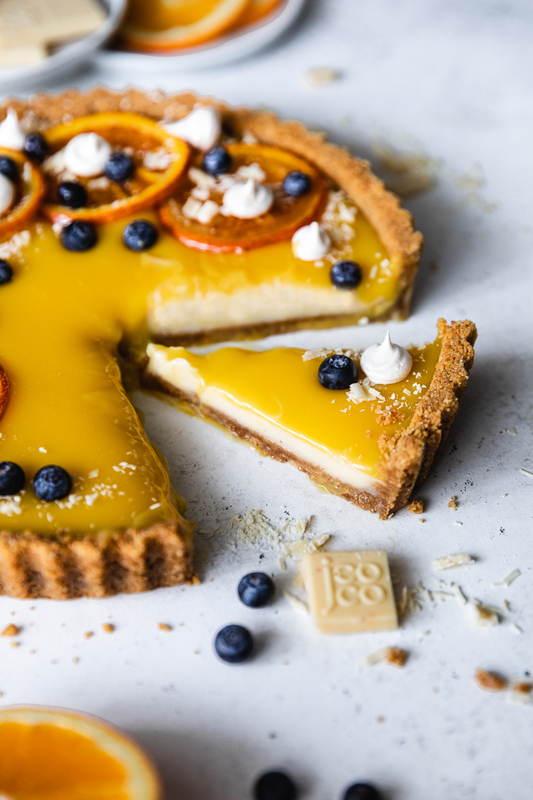 I created this tart to enhance the flavors of the Jcoco’s Cayenne Veracruz Orange white chocolate bar. A simple graham cracker crust with a layer of melted chocolate and a layer of orange curd on top to make it bright and sweet. It’s very easy and completely make ahead. I will strongly suggest that you make it the day before. I’m including the candied oranges and meringue drops recipes if you want to have fun with the decorations, but they are totally optional. 1. Even if you can use a regular white chocolate, the fun here is the contrast between the citrus oranges notes and the spicy notes. That is what makes this tart so vibrant. I encourage you to put your hand on these bars to have the complete experience. 2. As mentioned, I strongly suggest that you make this dessert one or two days in advance. That way the texture will be perfect. 3. If you are in a rush, the freezer is your friend. Freeze the chocolate for 20 minutes before pouring the curd and freeze the whole tart for 2 hours before serving. Cut and serve immediately so it doesn’t have time to melt. 4. If doing the meringue drops and, as me, you use raw natural sugar pulse it on a Nutri-Bullet or food processor just a few seconds until almost pulverized. You need extra fine sugar to make meringue. 5. Place the tart pan over a baking sheet before pressing the graham crackers. This way you’ll not have crumbs around your counter. 6. This recipe calls for 3 bars of chocolate, including some pieces for decoration. To make the meringue cookies: Preheat oven to 225°. Make sure the bowl and attachment you’ll be using are completely clean and dry. Any grease could affect the meringue. Place the tip of your choice on a pastry bag. Alternatively cut a corner of a large plastic bag and insert the tip. Secure the base with a rubber band or, if you watched my Instagram Stories a few days back, a clean hair tie. Start by rubbing the bowl and the whisk with the lemon, making sure there’s no parts of the lemon left inside or in the whisk. Place the egg whites with the cream of tartar and salt and mix in slow speed until the whites become foamy. Increase the speed to high (Level 8 on the Kitchen Aid) and mix for about a minute, until soft peaks forms. With the mixer running start adding gradually the sugar, one tablespoon at a time. Mix until stiff peaks forms, about two minutes. Stop there and do not over mix. Transfer the meringue to your bag and start piping little drops on your parchment paper or silicon mat, leaving about ½” between them. Bake for 1 hour. Turn the oven off and let the meringue cookies cool down for an extra hour. Do not open the oven door. After taking the cookies out let them dry in a cool dry place. To make the candied oranges: In a large skillet mix the sugar and the water using a hand whisk until they have an homogeneous texture. Turn the heat on to medium and continue whisking just until the sugar has dissolved. As soon as it starts boiling submerge the orange slices in the liquid. Cook for 10 minutes per side, being careful the sugar doesn’t burn out completely at the end. Using some cooking thongs remove from the skillet each orange slice, placing it on a cooling rack. Let them cool and dry in a cool dry place for 2 hours. Carefully peel each slice from the rack with a small spatula or pairing knife. Use them to decorate the tart. To make the graham cracker crust: Preheat oven to 350°. Place the cookies and sugar in a food processor and pulse them until you have small crumbs. With the food processor running start pouring the butter on a stream through the large lid hole of the food processor. Stop the motor and scrap down the walls and bottom of the bowl to redistribute the butter. Pulse again and repeat this process a few more times, until you press the crumbs and they hold its form. The butter should seem well distributed and the crumbs should look hydrated. Transfer the crumbs to the tart pan and press them towards the bottom and edges. You may use a small bowl or measuring cup with a flat bottom to press the cookie crumbs. Press them until the border is about ¼” thick, then distribute the rest of the crumbs through the center. Bake for 7 to 8 minutes. If the crust is a bit inflated when you take it out, very gently reshape it with the utensil you used to press the crumbs. It will take its form back. Let it cool down completely before assembling the tart. To make the white chocolate layer: Place the chocolate squares in a medium glass bowl. In a small bowl mix the cornstarch with a bit of the coconut milk until dissolved. In a small saucepan heat very gently the rest of the coconut milk, until barely simmering. Incorporate the cornstarch mixture and stir to mix everything. Pour the liquid over the chocolate and wait about 20 seconds. Using a silicon spatula start stirring until the chocolate melts completely. Pour the melted chocolate over the tart crust and put it immediately on the fridge to chill. It should be set before adding the orange curd. To make the orange curd: In a large glass bowl whisk the eggs and egg yolks with the sugar and orange juice. Fill a large skillet with enough water just to cover about ¼ of the bowl. Place the bowl on the skillet and bring to a simmer over medium heat while whisking constantly using a hand whisk. Keep whisking until the sugar is dissolved and the mixture starts to heat. Continue moving with a wooden spoon. Stir slowly but almost constantly until the mixture thickens, about 7 to 10 minutes but it could take a bit longer. You are looking for a mixture that covers the back of a wooden spoon and when you run a finger through it the mixture will leave a clear pass. Add the orange water and stir just for a few seconds more. Retire from heat and immediately pass the mixture through a sieve. Start adding the butter, a few cubes at a time and mix until almost melted before adding the next cubes. Mix until all the butter is melted and then continue mixing for a couple of minutes more to make the curd more airy and light. Pour over the chocolate and chill in the fridge for 4 to 6 hours, preferably overnight. To assemble the tart: Decorate the tart with the candied oranges and shred some of the spare white chocolate on top of it. Add blueberries or any other fruit you like with dessert for a touch of freshness.